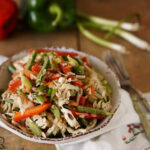 This pepper slaw is refreshingly different. Sweet and tangy and full of colorful crunchy fresh veggies. 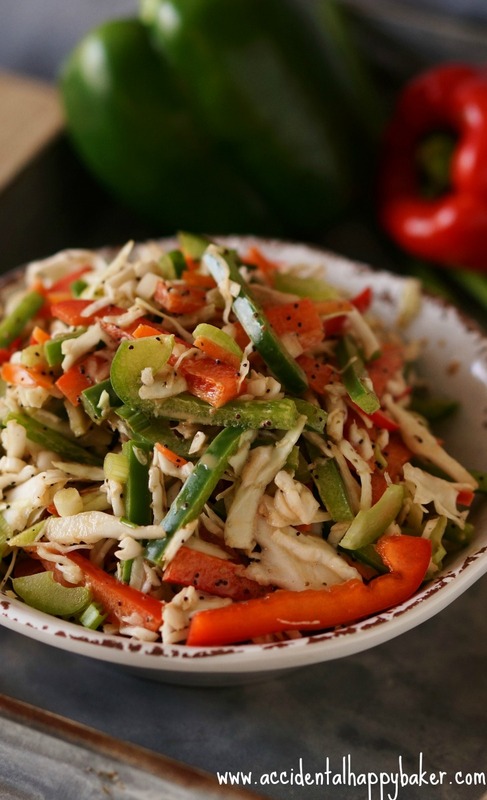 Pepper slaw pairs excellently with pulled pork sandwiches and is easy to whip up the day before to bring to a dinner or potluck. In my house everyone knows that Tuesday nights are blog post nights. My kids know that I will need a couple hours alone time to write and edit photos. 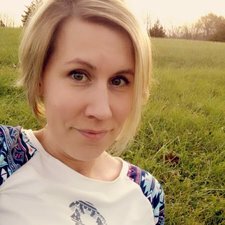 Blog night especially bothers my youngest son, he just wants to be in the room with me helping with whatever is going on even if it’s something that really doesn’t require any help. 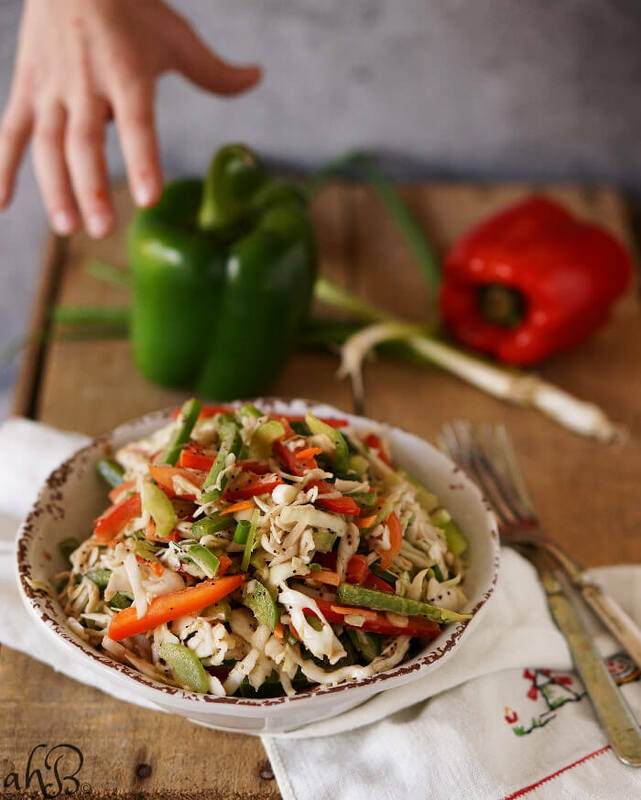 Now you would think when I lean more towards baking that the kids would be stampeding in for cookies and that pepper slaw wouldn’t be a huge draw, but my kids love fresh bell peppers. Especially this kid. So all throughout the photos he was asking me things like, “Can I eat this pepper? How about if I pretend to grab this pepper? Can this be my after school snack? 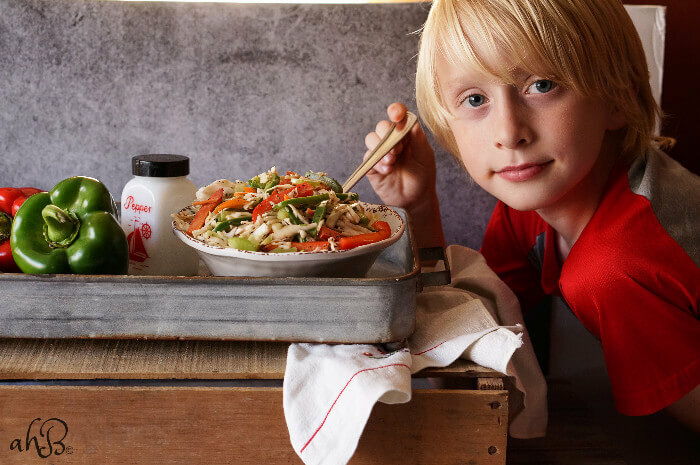 What if I hold the fork like this for the picture?” And then he decided that I’d probably better take his picture by the pepper slaw so that people will know that kids will like this slaw. I don’t think that he’s aware that most kids his age aren’t in love with peppers. My kids are veggie eaters though. I thank the heavens that I wasn’t given picky eaters! 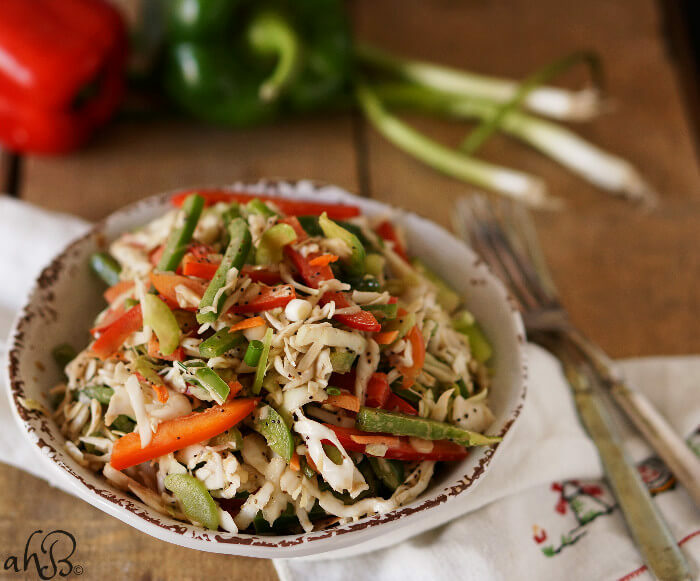 Next time you’re looking for an fresh and easy side dish to try, give this pepper slaw a whirl. (Or use it to top off a barbeque sandwich! MMm, delicious.) My pepper slaw recipe is adapted from this recipe on Food Network. 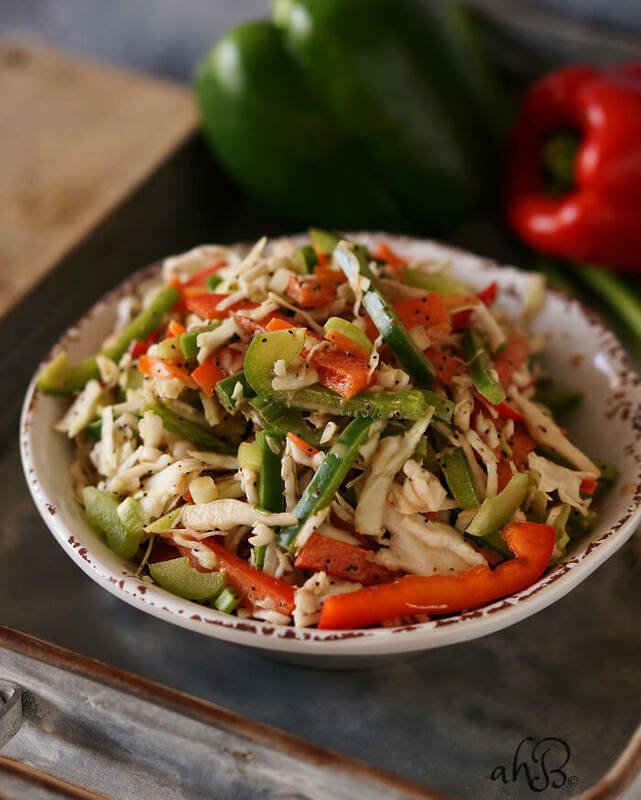 This pepper slaw is refreshingly different. Sweet and tangy and full of colorful fresh veggies. Julienne the bell peppers. Thinly slice the green onion and celery. Combine with the bag of coleslaw mix in a large bowl. That salad looks pawsome! can’t wait to have George make it for me! Thanks Rosina! I sure hope that you guys will love it. You’ll have to tell me what you think!